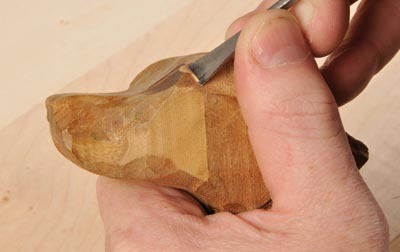 Once again, tool manufacturer Ashley Iles has teamed up with woodcarver Peter Benson to produce a range of carving tools, but this time the emphasis is on detailed tools rather than an overall set, as tested in Woodcarving issue 106. The Detail Selection came to fruition after a discussion between Peter and Ashley Iles to produce tools which were easily portable, yet still maintaining the standard and quality we have all come to expect from the Ashley Iles stable. After originally experimenting with constructing a single handled tool to accept a range of blades, the idea evolved into creating a short, permanently fixed blade with a long and slender handle. Deciding on which tools to make available was an easy one. Peter only had to look at which profiles were used most frequently by himself and the students he teaches to arrive at a list of 12, which has since grown to include a No.5 5/16in gouge, fishtail gouges and fishtail skews. We were rather excited to try these new tools and hurried down to the workshop to start playing. Taking them out of their packaging, we oohed and aahed over the nice rosewood handles, whilst noticing how small these were compared to the average sized tool. In spite of the smaller handles, the blades looked to be of the usual high quality from Ashley Iles. First impressions were so far favourable but the proof, as they say, would be in the pudding. As expected, each tool was honed and sharpened, ready to use. In the hand, they felt comfortable and due to their size, it was possible to hold them in a variety of ways and still feel that the resulting cut would be the same. And certainly, this proved to be the case. Carving with the V-tool, skew gouge, fishtail, and straight gouge, all proved to be rather pleasurable. Apart from the obvious difference in size to conventional tools, the Detail Selection handled just as well, if not better in some instances, to the bigger tools normally used. They proved extremely useful for achieving high detail in smaller areas where a bigger tool might cause problems, and indeed, these tools are exceptional for the smaller, details on your carvings you might be working on. The Peter Benson Detail Selection really is remarkable and I wouldn't hesitate to recommend these for fine, detailed work, and for the ease at which these can be transported. They may take some getting used to due to their smaller dimensions but remember, size doesnâ€™t matter; it's what you do with it that counts! 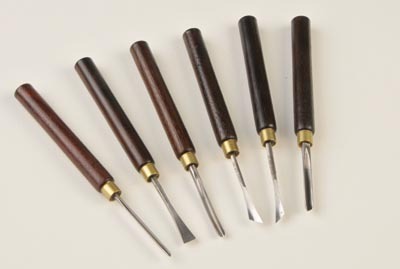 Set 1 includes: 1/16in No.40 curved V-tool (60°); 1/16in No.18 curved gouge (No.9 sweep); 1/4in No.3 fishtail gouge; 3/16in No.4 fishtail gouge; 5/16in No.5 fishtail gouge; and 3/16in No.20 curved gouge (No.11 sweep). Set 2 includes: 3/8in No.3 shallow gouge; 5/16in No.4 LC skew gouge; 5/16in No.4 RC skew gouge; 1/16in No.41 straight V-tool (45°); 1/8in No.18 curved gouge (No.9 sweep); and 3/16in No.39 straight V-tool (60°). Pick up the 100th issue of your favourite woodworking magazine today!